Article update: We were saddened to hear about Micheal’s passing on August 4, 2018. I credit Michael with gifting my girls and I a deep love of the Lough Gur area and all its treasures. 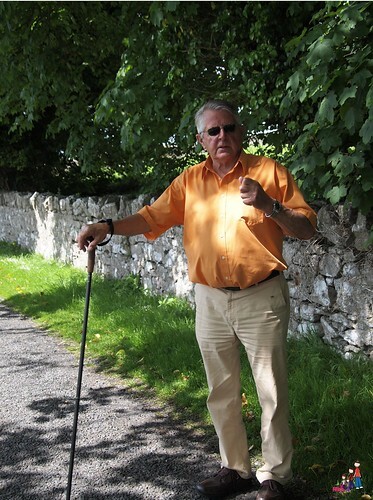 In tribute I am re-publishing this article about our tour of Lough Gur with Michael in 2012. When Miraim at The Old Bank in Bruff told me she had arranged a guided tour of Lough Gur for us with historian Michael Quinlan, I wasn’t sure what to expect. Lough Gur and the surrounding area are so rich in culture, history and magic. And while my reading and research had me looking forward to exploring the area, they didn’t bring the past to life or help us see the magic shimmering across the landscape, the way a personal tour with Michael did. As Micheal led us from the Lough Gur Visitor’s Center, he not only engaged me, but he spoke directly to my daughters- then ages 5 & 7. He told them tales of the first people to live at Lough Gur, sprinkling in bits of Irish to help keep their attention and make them ask questions. From Cárraig Crothera (Hangman’s Rock), a steep hike above Lough Gur, to the Wishing Seat near the banks, Michael shared the history, discoveries and legends that make this area so important. Micheal, knowing his audience, pointed out a tuft of trees and bushes about half way up the hill across the lough from where we stood. “Do you know what that is?” he asked my daughters. They shook their heads no, waiting to hear what Mr. Michael would tell them next. My youngest was a bit worried as they had just heard the tale of the 3rd Earl of Desmond, who lives beneath the waters of the lake. My youngest, who’s dearest wish is to be a real faerie, wanted to go right away, but quickly changed her mind when Michael warned that she would have to venture in alone. Michael told his tales in a way that wove history and fantasy together for us. From the Giant’s Grave and the New Church, to the Grange Stone Circle, Michael led us to some of the most incredible sites Lough Gur had to offer. As we stood in the center of the stone circle, Michael confided in me, “I told Miriam I would give you an hour, but no more.” By this time we had spent nearly two and a half hours mesmerized by his knowledge and were running late for our afternoon activities. “When the company is delightful and eager to learn, the seanchaí (Irish for storyteller/ historian) will always continue,” Michael said as he kissed me on both cheeks and departed. The Lough Gur Guides were established by Michael Quinlan. Arrange your guided tour of Lough Gur by email using the online contact form or call 353 061 385186. The experience will bring this incredible area to life as you wander through centuries of history. Micheal Quinlan has written an entrancing Lough Gur Trilogy. This fictional tale begins in 3500BC with the settlement of Knockadoon at Lough Gur. Michael guides you through the Stone and Bronze ages and into early 20th Century Ireland, weaving together known history and imagined characters with such grace that it is difficult to say where the known and unknown intersect. Many of the known tales of Lough Gur have come from the book The Farm by Lough Gur, which was re-launched in 2010. 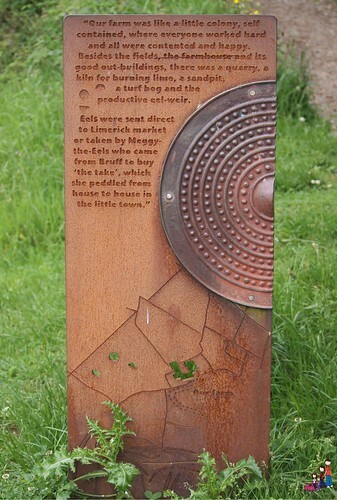 Along the walking paths near the lough, you’ll see excepts from the book inscribed on metal plates bearing an image of the Sun Shield. All books are available at the Lough Gur Visitor’s Center, but if you can get them before your trip, I highly recommend them! Ireland Family Vacations humbly thanks Michael Quinlan for his time, company and incredible tour of the Lough Gur area. I hope that when we meet next, we can take more time and enjoy a pint or two while listening to your incredible tales! Thank you for republishing this post. I have known Michael for only 5 years – he was our driver/guide for groups I bring to Ireland every year since 2013. Sadly, he could not drive this year – I intended to ring him on Monday, when my guests had returned. But I was too late, he died on Saturday. I attended his funeral in Loch Gur; it was such a beautiful tribute to a truly remarkable man. I was told by local friends that the funeral was well attended. I wish I could have been there. He was such a wonderful man- thank you for sharing your memories. I am trying to reconnect with Michael Quinlan. My family has toured 3 times with him over the past 10 years -I have lost contact – will you be able to help me? I’m sorry I don’t have a direct email for Michael, Phil. Your best chance would be to contact the Lough Gur Visitors Centre and have them pass on a message. @IrishFireside Thanks for RT. Did you see the email I sent about contributing to ITK site?